International Business Machines, Owens Corning, and Stanley Black & Decker serve as good examples of value investing options. Value stocks are attractive because there's usually something about them that limits the downside, whether it's a high dividend yield, a low price-to-earnings (P/E) ratio, or high free cash flow (FCF) generation. Investors can think of a value stock as having limited downside but good upside potential -- a good investment, in my book. Let's look at three good examples of value stocks you can buy right now. I like to look at enterprise value (EV) to FCF because it's a metric that factors in debt loads -- EV being market cap plus net debt. Moreover, consistent FCF generation is arguably the best metric to follow with a value-stock candidate, because it's what a company can use to increase dividends, buy back more stock, make acquisitions, or pay down debt -- all good things for investors. 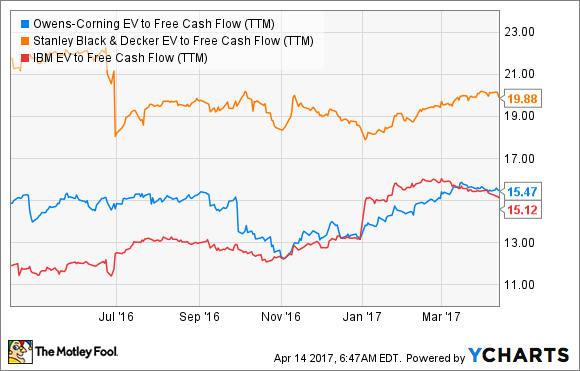 Owens Corning, International Business Machines Corp., and Stanley Black & Decker, Inc. all have an EV/FCF multiple less than 20. If you flip this ratio, it means that they're currently generating more than 5% of their enterprise value in free cash flow -- not bad in a world where the U.S. 10-year Treasury note yield, a proxy for a risk-free investment, hasn't been above 3% in the past five years. 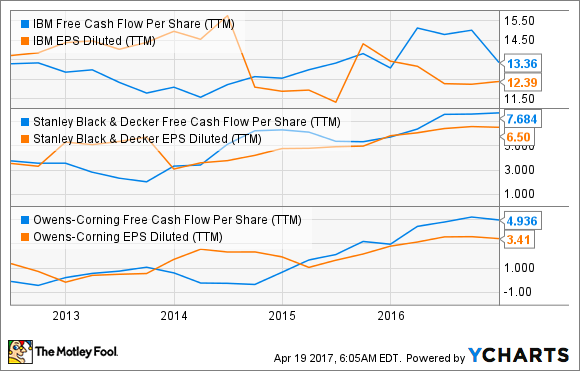 OC EV to Free Cash Flow (TTM) data by YCharts. The good news is that all three stocks are also set to grow earnings in the coming years. Data source: Analyst consensus estimates. As you can see below, all three companies do a good job of converting earnings into FCF, so you can think of EPS growth as a proxy for FCF growth. One way value investors can make money is by looking for stocks that are increasing productivity through corporate actions such as acquisitions, divestitures, and restructuring. In the case of Stanley Black & Decker, all three apply. The merger of Stanley Works with Black & Decker in 2010 kick-started a series of initiatives designed to improve growth and productivity. SWK Return on Invested Capital (TTM) data by YCharts. Of particular note is the improvement in the cash conversion cycle (CCC) -- a lower number is better. Put simply, CCC is the number of days a company takes to collect cash from its disbursement. The company has done seemingly simple things such as pay its suppliers later (that's days payable outstanding) and receive money more quickly from its customers (days sales outstanding). The result created a dramatic improvement in the CCC and has helped the company improve FCF generation. 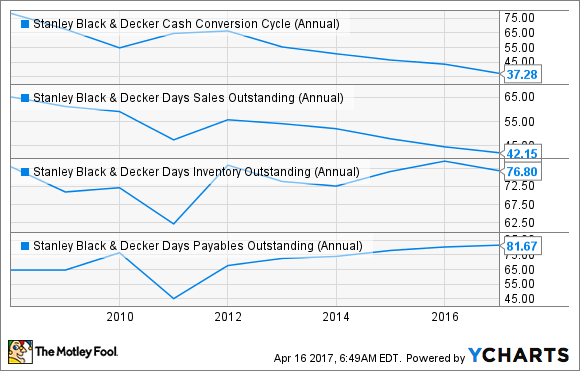 SWK Cash Conversion Cycle (Annual) data by YCharts. The good news is that the initiatives haven't stopped yet. For example, an agreement has been reached to sell its mechanical security business to Dormakaba for $725 million, while the $1.95 billion deal to buy the tools business of Newell Brands Inc. is expected to be earnings accretive from the first year. 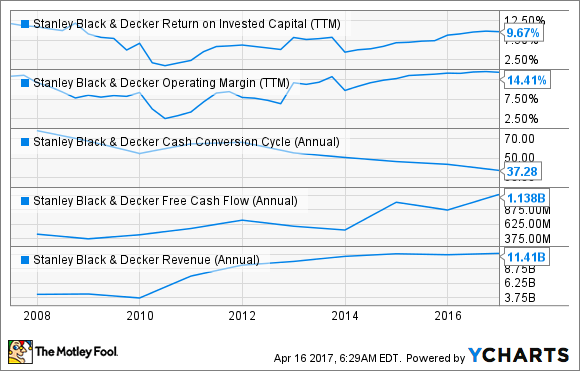 If Stanley Black & Decker can continue to execute its strategy well, then the stock offers a good value proposition for investors. The question for IBM is whether its reputation and financial firepower will hold it in good stead as it seeks to generate enough sales with its so-called strategic imperatives -- big data, analytics, cloud services, mobile, and IT security -- to offset declines in some of its legacy businesses. The following chart helps illustrate the matter. Currency-adjusted strategic-imperatives revenue grew 14% in 2016 to $32.8 billion, representing 41% of sales. However, the rest of IBM's revenue declined 10% to around $47.1 billion, leading to an overall reported revenue decline of 2% to $79.9 billion. Data source: IBM presentations, author's analysis. Chart by author. Data in billions of U.S. dollars. IBM made significant divestitures in 2015. Analysts have IBM's revenue declining 1.6% in 2017 and then coming in roughly flat in 2018. IBM should hit an inflection point in 2019, when revenue -- driven by strategic-imperatives growth -- starts growing again and earnings growth steps up. If so, then IBM would make a good value investment right now. Roofing materials, insulation, and composites company Owens Corning offers investors good exposure to the U.S. housing market, with 15% of its sales going to new residential housing in North America in 2016, and 38% going to North America repair and remodeling. A further 21% goes to the North American commercial and industrial markets. The following chart of earnings before interest and tax (EBIT) shows how the company made its money in 2016. Data source: Owens Corning presentations. Chart by author. Roofing segments revenue can bounce around from year to year because of weather conditions, but of course storm damage is usually good news for roofing companies. However, the general sales trend is in line with conditions in the U.S. housing market. Meanwhile, composites demand is seen as growing at rate of 1.6 times industrial production. In other words, as long as the economy is growing, Owens-Corning should see composites growth. Insulation has the biggest question mark next to it. Following the previous housing bust, there was substantial overcapacity in the industry, and as a consequence, the insulation EBIT margin of 7% in 2016 is nowhere near the mid-teens rate recorded before 2008. However, management claims to be recovering its market position in 2017, and pricing conditions are improving. Ultimately, management expects EBIT of around $160 million in 2017, compared with $126 million in 2016, and has declared confidence in getting margin back to historical levels -- something a lot easier to do with a growing housing market. 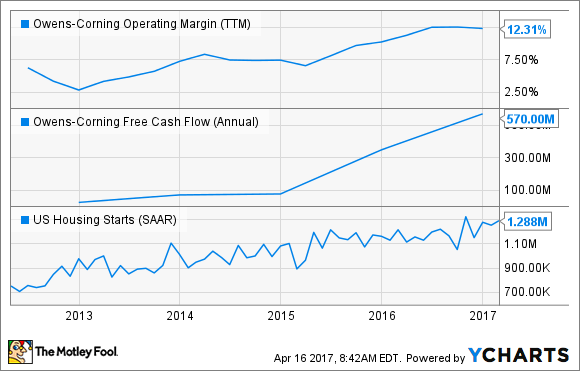 OC Operating Margin (TTM) data by YCharts. All told, Owens Corning is a good value stock, offering investors a margin and FCF growth story within the context of growing end markets. Stanley Black & Decker, IBM, and Owens Corning all offer investors different routes to earnings and FCF generation -- whether it be by corporate actions, sales growth, or margin and end-market improvement. They're all worth a good look for value investors.